Tales of their origin populate the folk lore of Russian history, we have heard of tales of children constantly destroying their cloth toys, over and over, until their father finally crafted a wooden toy, the children did not destroy it, but they eventually grew bored, since it did not have the potential for movement that their former cloth toys had. So the father attached joints to the toys, with a string weighted with a small wooden ball attached to the joints. A swinging circular motion would bring the formerly stiff toys to life, and the children were mesmerized. 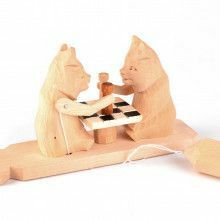 Now back to their modern day application, we don’t mean to bad mouth technology, it has given us a plethora of advances, and luxuries few would’ve thought possible only a hundred years ago, but there is something to be said for the simple charm of these wooden children toys. The imagination of a child is a wonderful thing, the creativity they exude is astonishing, and the application of said creativity into the world is said to greatly advance critical thinking, and problem solving skills in young ones. Nowadays toys are unnecessarily complex, and provide instant gratification. If a child wishes to play with a toy, it simply follows the pre-ordained instructions, and is entertained. Press a button, the toy makes a sound, hit a switch the toy lights up, there are a pre-set series of rules to achieve a desired action. Part of the joy of being a child is in the endless curiosity that comes with that stage of life. Just count how many times your child asks, "Why?" and you’ll find this statement affirmed. With these wooden toys the question "Why?" is part of the fun. Why does the bears arm move this way? What happens if I swing the toy this way? What would happen if there was no weight attached to the strings? All of these questions build up the critical problem solving skills that so many modern toys ignore. The tactile nature of these toys allows each of these questions to have an answer, which a young mind can figure out. Just as the creation of the toys taught peasant children in Bogorodskoe some basic laws of physics, so can playing with them, and wondering how they work. The simple nature of these toys allow children to figure out how the toy works for themselves, and who knows, they might inspire a young girl or boy to take an interest in engineering, or physics? Or they might just be entertained by a bear playing a guitar, because after all, who doesn’t love a bear playing a guitar? 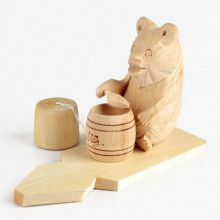 You’ll notice that the bear is an a popular motif in some of our kids toys, and that’s no accident. The bear is an important animal in Russian culture, and have a long fabled history. The Russian fairy tale Morozko features a character Ivan, who thinks he is above nature, and the bears, and tries to kill a mother bear, and her cubs. The punishment Ivan received is to have his head turn into that of a bear’s! The personality of a bear in old Russian folk tales is also said to be the closer to that of a human than any other animal. There is a common theme that humans are a part of nature, and not a controller of it presented in Russian tales regarding bears. 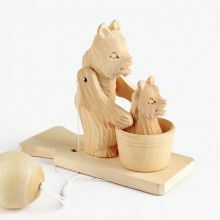 These toys also exemplify that aspect of Russian folk lore you’ll notice bears using computers, bears on picnics, and other human actions being performed by the bear! Another common theme is that of peasantry, the woman feeding the chickens is a common Russian toy to find. 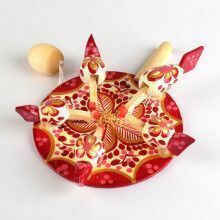 When the soviets took over Russia in 1917, they condoned and supported the spread of Russian folk toys such as these. The showed off the charm, and glorified that of the peasant lifestyle. The colorful Pecking Hen toys provide a nice contrast to the natural colored Bear toys. Both of these toys work great as simple entertainment, or as a charming piece of cultural heritage. 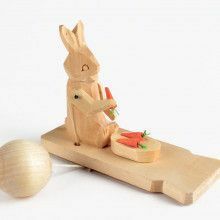 So even though they are sure to peak the interest of children, these toys are perfect splash of playfulness for any home decor. Take a look at these toys in action!